Betty Howard made many people happy today, and it was not for her daily special. 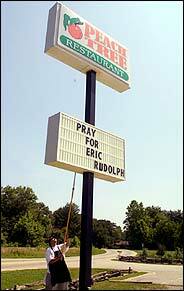 Around noon, Mrs. Howard walked outside, glanced up at the sign in front of her diner and decided to change the lettering on the marquee from 'Roast Turkey Baked Ham' to 'Pray for Eric Rudolph.' 'Bless his heart,' Mrs. Howard said. 'Eric needs our help.' Mrs. Howard said she was going to start an Eric Rudolph legal defense fund. Many customers have already said they would chip in. A day after the authorities finally collared Eric R. Rudolph, the 36-year-old phantom survivalist who had been wanted for five years in connection with the bombing at the 1996 Olympics and attacks on abortion clinics, it is becoming clearer how fiercely loyal this community is to him, and how that might complicate the case. With Mr. Rudolph in jail, the investigation is shifting to who in this rugged corner of western North Carolina might have helped him. And there may be no shortage of suspects. If there is an antigovernment current here, coursing through the woods clear as a splashing brook or a pint of moonshine, it is nothing new. Tucked away in the foothills of Appalachia, surrounded by towering forests and fading mills, many people in the neighboring towns of Peachtree, Andrews, Murphy and Hanging Dog say they have always preferred to handle their own problems their own way, which may explain why nobody turned in Mr. Rudolph. Mr. Rudolph, who once topped the Federal Bureau of Investigation's most wanted list, is accused of four bombings: the blast at the Olympics that killed one woman and injured more than 100 people; an attack on an abortion clinic in Birmingham, Ala., that killed an off-duty policeman; a bombing at an abortion center in Atlanta; and an attack at a gay nightclub, also in Atlanta. The authorities say Mr. Rudolph planted the 40-pound pipe bomb that ripped through a crowd on Jul. 27, 1996, at the Olympic Park in Atlanta. The blast killed Alice Hawthorne, 44, a receptionist, and injured more than 100. The next strike was on Jan. 16, 1997, when two bombs blew up outside the Northside Family Planning Service, an Atlanta-area clinic where doctors perform abortions. The explosions injured seven people. Then on Feb. 21, a bomb detonated at the Otherside Lounge, a gay nightclub in Atlanta, injuring five people. The last attack attributed to Mr. Rudolph was on Jan. 29, 1998, outside the New Woman All Women Health Care Center in Birmingham, Ala., which also provided abortions. The bombing killed Robert D. Sanderson, an off-duty police officer, and left Emily Lyons, a nurse, blind in one eye.